Macy Miller was selected in the third round of the WNBA Draft Wednesday night. UNDATED - South Dakota State women's basketball career scoring leader Macy Miller was selected in the third round of the WNBA Draft by the Seattle Storm Wednesday night. A 6-foot guard, Miller was the final selection in the draft and will join a Seattle squad that won the WNBA championship in 2018. Miller saw her stock rise after competing at a pair of pre-draft camps this past weekend in Tampa, Florida. Miller says she was shocked when the news came, and says it culminates a dream for her. Miller was honored as the Summit League Player of the Year during both the 2017-18 and 2018-19 seasons. 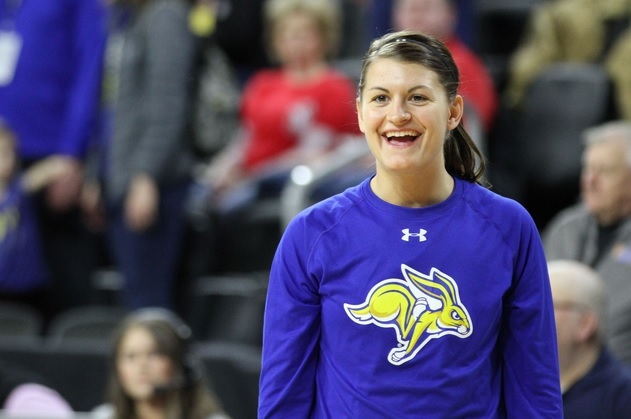 Her 2,355 career points are both SDSU and Summit League records. During her senior season, Miller averaged 18.2 points, 6.1 rebounds and 3.4 assists per game. She shot 52.7 percent from the field and 84.1 percent at the free throw line while scoring in double figures in 31 of the Jackrabbits' 35 games as they reached the Sweet 16 of the NCAA Tournament for the first time in program history.